This toffee caramel shortcake recipe is a very old, but delicious family treat, so please excuse the ounces. 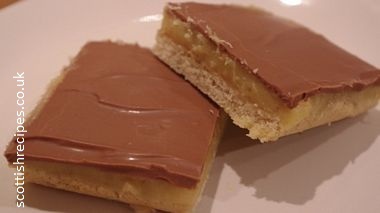 It is also known as Millionaire's shortbread. 1. Cream the caster sugar with half of the margarine and then add the flour. 2. Knead as you would for shortbread then roll out and bake in a swiss roll tin at 180C until slightly brown. 3. Mix the other 4oz margarine with the golden syrup and add the condensed milk. Bring it to the boil in a small pan and continue boiling for about five minutes stirring continuously. Then spread the caramel mixture over the shortbread base. 4. Melt the chocolate and pour it over the toffee mixture. 5. Allow to cool and then cut into pieces. 6. Store in the fridge or an airtight container for about five days, though they never last that long in our house and are all eaten the same day!